How to Convert PDF to Editable Text Files on Windows 8/7/XP? Many tools can help you achieve the goal to convert PDF to text files. Such as Adobe Acrobat and various online PDF to Text converter programs. However, if you take output quality and budget into consideration, you’d better choose a professional yet affordable third-party PDF to Text conversion program. The following Coolmuster PDF Converter Pro is providing an effective way to convert PDF to editable text. Coolmuster PDF Converter Pro is not just converting PDF to Text, it is a 5-in-1 PDF solution which is able to export Adobe PDF documents to Word, ePub, Text, Images, HTML webpages, etc. 200 PDF files can be converted at one time within 1 minute. You can even perform a partial conversion and preview the PDF before you begin the converting task. Launch the PDF conversion program on your PC, click "Add Files" or "Add Folder" to load the target PDF files to the program. Batch conversion is supported that you can add as many as PDF files you want at the same time. 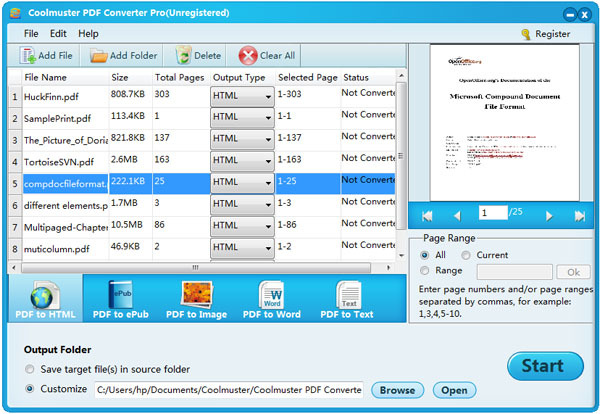 As I mentioned above, PDF Converter Pro is a 5-in-1 PDF solution. So, you need to choose the conversion type as "PDF to Text" and then set up "Output folder" at the bottom of the program window by browsing, make sure there is enough free space at your designated path. Tips: Default page range for conversion is All pages. If you need, you can also customize the page numbers or page ranges to convert specific pages. Now, we are arriving at the last step. What you need to do is just clicking the "Convert" button to begin the conversion. During the conversion process, the Convert button will change into "Stop", which means you can pause the conversion whenever you want. After the conversion, you click the "Open" button to locate to the output folder and check the converted text files. Saving PDF to Text is very easy, isn’t it? 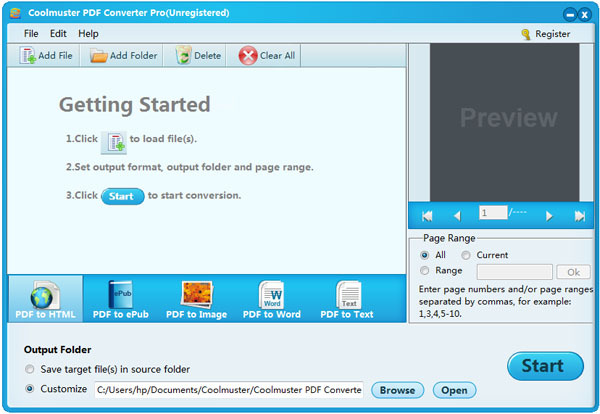 Why not downloading Coolmuster PDF Converter Pro to have a try right now?